WASHINGTON (JTA) — Israelis and Palestinians must revive their will for peace, Vice President Joe Biden told AIPAC in a speech that earned thunderous applause for emotional expressions of affection for Israel and scattered boos for criticism of settlements. Biden’s speech Sunday night to the American Israel Public Affairs Committee annual conference will be his last as a public official to the Israel lobby, and the cheers he earned throughout reflect his status as the Obama administration official most loved by the pro-Israel community. U.S.-brokered talks between Israel and the Palestinians broke down on June 14, just months before war erupted between Israel and Hamas in the Gaza Strip. In describing the conditions behind the loss of will for peacemaking, Biden emphasized repeatedly the need for Palestinians and others in the Arab world to end incitement. 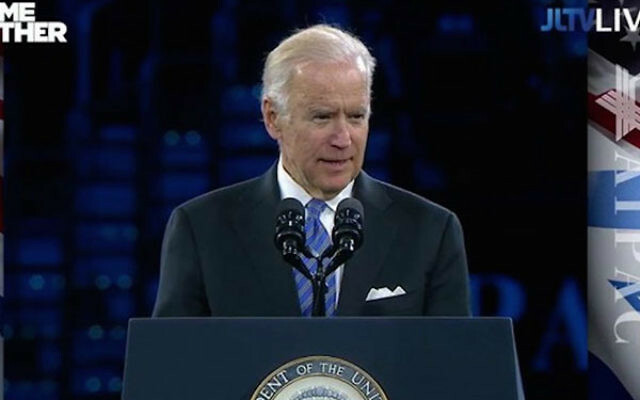 “No matter what the disagreements the Palestinian people may have with Israel, there is no excuse for killing innocents or remaining silent in the face of terrorism,” Biden said at the Verizon Center, a Washington, D.C., sports arena being used for the first time by AIPAC to accommodate the record-breaking 18,000 activists in attendance. He said he delivered that message to Palestinian Authority President Mahmoud Abbas, earning the conference’s first standing ovation. “The terrorism has to stop, the incitement … it must stop,” said Biden, who at 73 jogged onto the stage, but whose voice was hoarse. A good portion of his speech was devoted to condemning terrorism and incitement, and to warning the Palestinians not to seek statehood unilaterally. But Biden also said Israel also should refrain from acts that would scuttle a peace plan. He cited “steady and systematic” settlement expansion and the sanctioning of illegal settlement outposts under the government of Israeli Prime Minister Benjamin Netanyahu. The remarks earned Biden a scattering of boos from across the cavernous hall. Biden tied anti-Semitism, particularly in Europe, to the “seemingly organized” effort to delegitimize Israel, condemning the Boycott, Divestment and Sanctions movement against the country to the rising tide of anti-Semitism. “No nation is immune from criticism, but it should not be singled out,” he said. Biden defended last year’s nuclear accord between Iran and six major powers that was bitterly opposed by AIPAC and the Netanyahu government. “I hope you are as happy as I am that they [Iran] are further and further away from obtaining a nuclear weapon,” he said of the sanctions relief for nuclear rollback deal. Biden stridently defended President Barack Obama’s Israel record. Biden told of meeting Golda Meir in 1973, a story he has repeated often to explain the visceral attachment he feels to the Jewish state. But he added a more recent experience — of finding out that his wife, daughter-in-law and two grandchildren were dining just half a mile away from a stabbing spree in Tel Aviv earlier this month that killed an American tourist. “It’s not imagined, it’s real,” he said of the anxieties Israelis feel. Biden said people asked him why he brought his grandchildren to Israel, considering the risks, and he said for the same reason he brought them to Dachau to understand the Holocaust. The vice president has visited the country many times since his first trip in 1973, when he was a freshman Democratic senator from Delaware. The AIPAC conference will host four out of five of the presidential contenders, including Donald Trump. Biden took a veiled shot at the real estate magnate and Republican presidential front-runner, alluding to Trump’s call to build a wall between the United States and Mexico, and his broadsides against Muslims. “Any action that marginalizes a religious group imperils us all,” he said. “The future belongs to the bridge builders, not the wall builders.” The hall erupted into cheers. Earlier, six Christian and Jewish clergy warned activists not to disrupt any speaker during the conference. A number of activists, including leading rabbis, have plans to walk out or otherwise show displeasure with Trump. Howard Kohr, AIPAC’s executive director, alluded to the anxiety that Trump’s rhetoric has sowed throughout much of the Jewish community.